Bank of America Joins HireVeterans.com! Supporting the military has been a focus of Bank of America for more than 90 years. This includes their partnerships with military organizations, efforts to hire and develop military service members and veterans, and their products and services for military customers. Military men and women make sacrifices every day to serve our country and they want to do everything they can to connect them to the resources they need to make their lives better. Bank of America actively works to attract, develop and retain veterans, reservists and military spouses because of the unique skills and experiences they bring to their organization. Their personal values align with the company's values around trusting the team, acting responsibly and realizing the power of the people. They support military employees through our Military Support & Assistance Group (MSAG), an employee network that creates opportunities for advancement and leadership development through networking, mentoring and information forums. Additionally, Bank of America supports the U.S. military through the Military Affairs Advisory Group (MAAG), an internal team that focuses on reintegrating service members into the civilian workforce through education, employment, wellness and housing. 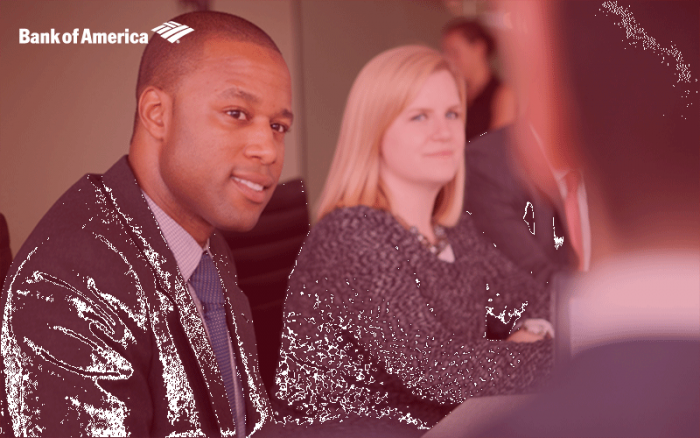 Click Here To View And To Apply To All Of Bank of America's Available Positions!